My name is Narinder Rohmetra. I graduated as Civil Engineer in the year 1977 from the Regional Engineering College, Srinagar (now known as National Institute of Technology). I have been recently retired as Chief Engineer of Jammu & Kashmir Government in October 2012 after working in the Hydraulic department (Road & Building, Water Supply, Irrigation & Power) for the last 35 years. I had faith in religion and God but I was not a person who would follow rituals precisely & vigorously. Except the Gayatri mantra, I never learnt any mantra. I only bowed down to God but rarely asked for anything except peace of mind and contentment. I was a staunch non-vegetarian who loved to have meat almost every day and also occasionally had alcohol. I did not believe in lying to anybody for personal gain. Even in my professional duties, I tried my best to work truthfully. I was very emotional and had a strong ego to convince everybody on my ideas. I always tried to judge/change the other person/situation as per my understanding. I was never a person who believed in Gurus. I always believed in myself. I never had an inclination to go to any Gurus in physical form. However, I had a great curiosity in understanding how life works – the origins and what happened after death.I strived to get that understanding from books and learned people but could never get proper convincing answers with the desired clarity. I should however state that I was not a avid reader of spiritual books. I was always operating through my mind 24*7 either gloating over the past or worrying about the future. I used to always get upset whenever things did not happen according to my wishes. I never learned to enjoy the present moment due to my analytical nature. Further, I had an overly critical nature that found fault with everything. God has always graced me with everything I needed materially. In hindsight, I was asking all these questions just for sake of it or maybe to judge Him. Haha. 🙂 Now, I realize that all these questions were just a mind game as only mind gets insecure and seeks answers. The very next day after returning from Patnitop (Kud), I had a beautiful experience. During the night at my house, I woke up to the loud sound of ringing bells. I had never heard such soothing sounds. I was fully awake and moving my legs but was unable to open my eyes. Through my inner vision, I saw Shesh Nag (the snake whose hood serves as an umbrella for Lord Vishnu) with very beautiful colors quickly moving in waves with a Glove in which Mohanji’s face was visible. I have never seen such beautiful calming colors. All His Grace! The next day when I went to meet Him, I asked Him “Did you visit me last night?”. He smiled and confirmed his presence. A day later, Mohanji was leaving for Delhi by an afternoon flight from Jammu. All of us went to the airport to see Him off. Mohanji was sitting in the small Jet Airways office chatting with the airline staff. I thought that it would have been better if He moved to the lounge so that we could also have the grace of His lecture. At that very moment, He said, “Let us move to the lounge so everybody can hear”. He turned to me and smiled acknowledgingly. There was an announcement to board the flight and it was time to say goodbye. Mohanji gave a hug to Suman and his wife Jyoti. I felt a strong desire that he should also give me a hug. He immediately extended his hand towards me and beckoned me to join. So there I was in His arms along with Suman and Jyoti. He was taking care of every desire of mine without me conveying it physically. After dropping him, we departed from the airport in complete silence. I reached home in about 15 minutes. When I reached home, strange things started happening to my senses.I was almost paralyzed and it took a lot of effort to move from one place to another. White light in the form of waves were continuously falling over me.I lay down on the bed and remained in that position till evening. Late evening, I made a call to Sumit and explained my situation to him. He asked me to come over to his place.When I reached his place, Mohnish and Mousami (the son and daughter of Dr. Deepali Jaju) were also there. They were narrating their astral journeys with Mohanji.They assured me that things will be alright soon. We performed the evening aarti of Sai Baba. Soon after the aarti,I was back to normal. Later, Mohanji explained that the white light resulted from clearing of my blockages due to the hug he gave me. AllHis Grace! A couple of years later, Sumit asked me to join them for a trip to the Maha Kumbh Mela in Allahabad (13th February to 19th February 2013). Kumbh Mela is one of the most sacred events in India and happens to be the largest peaceful gathering in the world. Over a 12 year cycle, It is conducted at 4 places – Nashik, Ujjain, Haridwar and Allahabad – on a rotational basis. Millions gather at these places during the Kumbh Mela to bathe in the sacred Ganga river. The Maha Kumbh Mela is a once in a lifetime event that happens after 144 years.This was my first participation in such a big assembly of people where around 30 million were expected to take a dip at the Triveni Sangam at Allahabad – the confluence of the three holy rivers Ganga, Jamuna and Saraswati. My colleagues and family members could not believe that I was going to the Maha Kumbh Mela because my general view of these events, until then, was overly critical. I dismissed them as a waste of time and unhygienic. I understood the value of these events only when I attended the Maha Kumbh Mela with Mohanji. We stayed in tented accommodation around 3 kms away from the Triveni Sangam. We visited several ashrams in the area around the Maha Kumbh Mela since Mohanji wanted us to get a feel of these ashrams and soak in their divine vibrations. We used to get up at around 2am, take a bath and then proceed towards the Sangam for a dip. Our group had three elderly persons- two ladies and Shashank’s father – who could walk very slowly and that too only with support. Mohanji, on the other hand, tends to walk fast and it is hard to keep pace with him. We were moving quickly through a big crowd. When we reached the place at the Sangam where we were taking dips, I thought that we may have to wait for Shashank who was coming with his father. But to my utter surprise, they were right behind us. Isn’t that strange? How did they manage to keep pace? One day, a saint visited our camp. Baba Goraknathji (the most famous of the nine Nath saints) communicated through Him.The saint told Mohanji that He was directed by Baba Gorakhnathji to give Shaktipat to Mohanji. As soon as the saint touched Mohanji’s third eye, the saint started shaking uncontrollably and went into a trance. Baba Gorkahnathji started to speak through the saint. The saint started predicting about Mohanji and about the rest of the group. I choose not to reveal the predictions due to their personal nature. Our group also got Shaktipat from the saint in that elevated state. In between the dates of the dips, we planned a one day trip to Ayodhya. It was raining very heavily.We reached a small ancient temple of Lord Hanumanji (considered an epitome of service through his devotion to Lord Ram). The presiding priest of the temple and his family prepared and served lunch for us with a lot of love. After lunch, when we were about to leave the temple,Mohanji saw an old man sitting in the verandah of temple with his back to the sanctum sanctorum. Among Hindus, it is considered disrespectful for one to sit with their back to the idol of deities. Mohanji asked Sumit to go and take his blessings. I also followed Sumit. To my surprise,I could see Hanumanji through the side of Sumanji‘s camera screen. An image of Hanumanji was overlapping that of the old man sitting in temple. This was only visible through through the camera screen. When I looked directly, I could only see the old man. Later, Mohanji explained that I could not see Hanumanji directly because I was excited and, hence, operating through the mind. I walked up to the old man (Hanumanji) and bowed to him to seek His blessing. He blessed me and said ”Khush raho” (Be happy) in a deep sonorous sound. I had never heard such a deep sound before. I could not control my emotion and was consoled by Mohanji with a hug. All His Grace! I have always had a very strong desire to see deities physically. After the Maha Kumbh Mela, we left for Varanasi to visit Kashi Vishwanath. I was continuously trying to connect to His Consciousness. After sometime, I had a vivid vision of Devatas (demigods), Devis (demigoddesses) and saints walking past my sight in a steady stream. It was like watching a movie. I hardly recognized some of them. The visions stopped when the driver announced a stop for lunch. In this way, Mohanji fulfilled my desire for a vision of saints.When I got down, He looked at me smilingly to check if there was anymore desire left in me. All His Grace! We had been taught Kriya yoga by Mohanji at the Patnitop retreat. Once I was doing my usual practice of Kriya yoga at my residence early in the morning. I felt a strong fragrance of sandalwood and camphor for some time. I am not very good at identifying fragrances. I knew that the fragrance indicated the presence of Mohanji. I bowed to Him mentally and continued my practice. He means it when he says, “I am always with you”. Later, I checked with him and He confirmed His presence. I participated in the Vrindavan retreat with Mohanji from 27thJanuary to 2ndFebruary 2014. On the 5th day, all of us had assembled for doing yoga at 6.30am. While performing the yogic exercises with closed eyes, I suddenly lost all feeling of the body and had a glimpse of Cosmic Consciousness.With closed eyes, my vision extended to 360 degrees and I could see in all the directions at the same time. I could see Mohanji and all the retreat participants around me. I saw Lord Krishna and Lord Shiva dancing. It is difficult to describe this state in words. While in that state, I could clearly hear the instructions of our yoga teacher (Sanjay sir ) and also perform all the exercises standing, sitting and lying down. But there was no feeling of the joints or the body during that stage.I had heard that God is omnipresent but wondered how? Also, Mohanji always said, “I am there with you all the time if you think of me from the core of your heart”. Until that time, I had only heard about consciousness but never felt it or understood it. Mohanji fulfilled that desire by granting me the experience.He carried me into consciousness by nullifying my mind. Now I understood how saints can communicate within a fraction of second. All His Grace! On that day, we visited the Barsana temple of Radhaji (considered an epitome of love expressed through her devotion to Lord Krishna) and the ISKCON temple. When I entered the temples, I was completely filled with joy. As I closed my eyes and bowed before the idol(s), the idol(s) completely vanished from my mind’s eye and I was transported to the time of the presence of Lord Krishna on earth. I saw the Mahals (palatial houses) in which they were living and moving around. This was happening in all the temples that I visited on that day. A day filled with an outpouring of divine blessings! All His Grace! I participated in the Wayanad retreat with Mohanji (2nd June to 8th June2014) in Kerala. On the last day of the retreat, I asked Mohanji, “We have not been blessed with Shaktipat this time”. He replied in a sharp and stern voice, “Why do you need Shaktipat when you are already in My Consciousness”. I kept quiet and understood that the thought was another game played by my mind. Late in the evening, we were all having dinner in dining hall. After finishing my dinner, Mohanji called me when I went to keep my plate in the kitchen. When I walked upto Him, He asked me to touch His spine.I touched and felt as if something was moving up and down His spine. I told Him what I felt. He smiled and said Ok . I felt like sitting down and took a seat a few seats away from Mohanji on the same table. The moment I sat down and closed my eyes, I sunk into a deep consciousness. I was transported to the period of Lord Rama. It was the time of the war of Lord Rama with Ravana. I could see Hanumanji fighting in the war alongside Lord Rama. I am not sure if it was a reflection of a past life or just a view of that glorious period. I also saw my previous lives with the present relation. It was like a rewinding of a movie in fast track mode. At the same time, I could hear the voices in the dining hall as well. I regained myself after an hour or so. When I opened my eyes, only one or two workers were present in kitchen. Everybody had left without disturbing me. All along, I was in sitting position and awake. He fulfilled my desire of Shaktipat. All His Grace! There are many more incidents but I mentioned only the ones which significantly changed my perception and perspective of life. Till date, I am unable to understand one thing. – to what do I owe this good fortune to have all these wonderful experiences? I am not the usual stereotype of a spiritual seeker. I have been a non-vegetarian and used to drink alcohol as well. I have neither done any major spiritual practices nor read many spiritual texts. I have no words to express my gratitude. This is all I can say. All His Grace! All His Grace! All His Grace! How all these experiences helped me in my daily life? I became a vegetarian by choice without any compulsion. I could see no difference between the consciousness of animals and mine. Hence, I could not accept putting any being through any pain to satisfy my cravings. I started loving everybody without expectations of love or anything in return. Even if they don’t agree with me. Previously, I would react to situations and people. Now I respond to them. I stopped carrying the guilt of the past. If I commit a mistake, I straightaway accept it without lingering on it. I now accept people around me as they are and stopped judging them. I prefer to change myself rather than change the situation. Earlier I was unsuccessfully trying to change situations and people as per my choice. Believe me that people change after you stop reacting. Now I only respond. I have started to enjoy the present moment. Once you are happy in the present moment, the past and future will be happy too. Now I do not suppress my desires. Either I fulfill my desire or let it go with awareness. Previously, I used to suppress them if they were unfulfilled. Now, my happiness is not dependent on outside objects, situations or behavior of people. Previously it was the contrary. My happiness depended upon the external. All this is due to His Grace! His Grace! And only His Grace! P.S: I am grateful to my nephew Sumit Gupta who guided me on this path of awareness and got me in touch with my Guru, my Teacher, my All. I am also grateful to Reva Gupta who always encouraged me on the path of spirituality. Skanda Vale is a multi-faith ashram and home to a resident community of 25 monks and nuns. Every year they welcome over 90,000 pilgrims to their three temples. Their work involves worshiping the Lord in his many forms, caring for hundreds of animals, providing food aid to people in need, giving spiritual education and caring for the terminally ill at their hospice. The ashram was founded by Guru Subramaniam who was born in Sri Lanka. The ashram is set in over 100 acres of woodland and is located in South Wales, about 250 miles away from London. One of the monks, Swami Govinda had travelled with the UK group to Kailash with Mohanji in 2014 and he had invited Mohanji and Biba to visit Skanda Vale whenever they came to the UK. A group of us travelled with Mohanji and Biba to Skanda Vale straight after the retreat. It was a long journey of nearly 5 hours but the time went in a flash as we reflected on the amazing retreat experiences. On his arrival, Mohanji was very warmly welcomed by all the Swamis who were eagerly awaiting his arrival, especially Swami Govinda. We had arrived just in time for a special Maha-abhishekam to the main deity in the Maha Shakti temple. This puja is conducted once a month on the Saturday before every full moon. On this occasion, the temple was completely packed full of pilgrims. In the terrace outside sat about 80 pilgrims who could not get into the temple. Outside the terrace hundreds of people watched the puja on a large TV screen as they could not get into either the temple or the terrace. The Swamis had very kindly kept space in the temple for Mohanji, Biba, my wife Ranjana and I. As well as the magnificent main deity of mother Kali which is about 2 metres high, there are pictures and murtis of all the different manifestations of God from the different religious traditions. The atmosphere in the temple for the full moon puja was an intense and amazing experience. The energy in the temple was at fever pitch. The mantras were chanted by the Swamis with intense concentration. The vibrant bhajans sung with utmost devotion accompanied by the beats of the drum, the harmonium, cymbals, bells and conch, sent waves of bliss through the congregation. During the bhajans, Abhishek was performed to the Divine Mother with vibhuti (mixed with water), milk, yoghurt, honey and fruits. In between each offering she was offered frankincense and arathi. After the Abhishek she was bathed with water, oiled with fragrant perfume, offered arathi again and serenaded with more bhajans. She was offered the sacrificial offerings of coconuts, lime and kumkum. Finally she was beautifully adorned with jewellery, colourful sarees, a shining crown, garlands of limes and the most colourful fragrant flowers. At the climax of the ceremony when the 108 names of the Divine Mother were chanted, Mohanji was invited into the sanctum sanctorum to offer petals to Her together with the Swamis. After the puja had concluded and all devotees had taken Arathi, Swami Brahmananda, the head of the ashram invited us into his private quarters to share a delicious meal that he himself had prepared. All the monks and sisters gathered together and we shared this meal in the room where Guru Subramaniam (who left his body in 2007) used to stay. We then had an insightful satsang with the monks and sisters where they got the opportunity to ask Mohanji many questions which were answered with clarity and purpose. The following day was the biggest day of the year for Skanda Vale, the climax of the Subramanium festival. The Subramanium festival starts off with the separation of Subramanium from his wives, Valli and Devani. The 12 days in between are a period of intense pujas, prayers and sadhana. The culmination of the festival is the reunion of Lord Subramanium with Valli and Devani. The final ceremony was held in a large outside space called the yagayashala and Mohanji was invited to sit with the monks at the front of the congregation. During the ceremony the ladies went off in a procession to collect Devani and Valli from the Subramanium temple. After their arrival, the men then went to collect Lord Subramanium in a procession. Mohanji was given the honour of carrying Lord Subramanium on the final leg from the temple to the yagyashala to reunite the lord with his wives, the union of Shiva with Shakti. Mohanji had a nagging gout issue and he could hardly walk. But at no point in time anybody felt any discomfort from him. He was as normal. Obviously he could have been in expanded consciousness. He carried the idol Lord Subramaniya barefooted and also in the cold atmosphere of Skande Vale despite his swollen feet. Just a short while ago he was on a wheel chair and later on crutches. But ever since he came to Skande Vale he methodically participated in every function that the monks invited him for. This ceremony was a heavenly experience with grace and blessings flowing abundantly on all the pilgrims. The swamis told us later that this was the best festival yet. Despite the rain, this was a festival with a difference, a festival imbued with a unique and special vibration! ‘Today is a particularly auspicious day… particularly special because we have a very revered guest with us. Mohanji has come to join us, to celebrate this festival. The first time I met him yesterday it was like meeting an old friend. Mohanji attended all the pujas and services at all the temples including a very moving Christian prayer service. The Swami conducting the service commented that it was one of the most powerful services that he has ever had the experience of conducting during his stay in Skanda Vale (over 25 years). During those blissful days the Swamis took Mohanji on a tour of Skanda Vale. We met the resident elephant Valli and fed her lots of fruit and bananas. She gave shaktipath to all of us by placing the tip of her trunk on our foreheads! We saw birds, deer, cattle, peacocks, geese, dogs, donkeys, horses, all of who have taken shelter in Skanda Vale and are lovingly looked after by the monks and sisters. The next day we attended the prayers in the Sri Ranganatha temple which is an open air temple of Vishnu lying on the serpent Vasuki surrounded by Lord Hanuman, Lord Brahma and Mother Lakshmi. Mohanji participated in the Poojas also at the reclining Lord Vishnu idol flanked by Lord Hanuman and Goddess Lakshmi despite the cold morning hours as well as the swollen feet. Swamiji himself held his hand and escorted him to the idol situated in the middle of a pool. Mohanji noted that Garuda (Lord Vishnu’s vehicle) should be there also and immediately made arrangements for an idol as per the approved standards of idols based on scriptures. (The idol of Garuda is getting ready and should be in Skande Vale by February 23rd, the 51st birthday of Mohanji). The temple is completely exposed to the elements and the deities are located in the middle of a small pond. The Swami’s have to walk across a plank to get to the deities for conducting the pujas. Mohanji was also invited to offer flowers at the culmination of the prayer. I was a little concerned as Mohanji was limping and had to walk on the plank. However Mohanji made it there and back with no trouble despite the pain in the leg and discomfort. The Swamis showed Mohanji all the building work being done in Skanda Vale. A major project that Skanda Vale have embarked upon is the creation of a hospice to care for the terminally ill. The hospice is located about 20 miles away from the ashram in the small village of Saron. Mohanji was invited to visit the hospice and see the construction work going on there in Swami Brahmananda’s new pickup. The previous pickup had to be replaced due to an accident. Swami was keen that the car should be blessed by carrying Mohanji as the first passenger! The unique open air environment, the peaceful location in woodland, the wonderful pujas and the welcome given by the swamis made the trip to Skanda Vale an unforgettable experience. We had many impromptu satsangs with the monks, sisters and visitors to Skanda Vale who all had a perfect opportunity to ask Mohanji questions on a range of spiritual topics. We spent three blissful days in Skanda Vale and left with some very special memories. First of all, I am grateful to my Guru, who is a gift from God. We know we have so many opportunities to show gratitude to our parents as they brought us to this beautiful world. But what about our Gurus (teachers, the Guru Tattwa, the supreme consciousness)? There are so many teachers whom we will meet in our life journey. Some of them shower their blessings upon us silently, which we realize over a period of time. As we realize these fragrances of love, we become more connected with our Guru and have that feeling of gratitude in our hearts with full warmth and happiness. Today, I am sharing my blissful experience which happened this morning. I don’t really know how to explain it or what to say. It all happened with Mohanji’s blessings. My family and I had been longing to see Mohanji for quite some time. We were so excited to hear about Mohanji’s visit to Chennai (last week). The satsang was on 24th November, evening, however due to the flooding in Velachery we could not make it. We were upset as our craving to see him was shattered. While I was lying on my bed on the afternoon of the 24th, my mind was full of grief and there were so many questions. At that time, a call came from Preethi Gopalarathnam’s mobile, it was Mohanji. He told us to take care and that we should not risk coming out. He also said that he would visit our house every week during meditation, hence we needn’t worry about coming and meeting him on that day. We had printed out the ID cards for the Chennai Satsang. Yesterday, Devadasji (Devettan) had asked us to send the eye cards of Mohanji to Palakkad. This morning, while I was busy in the kitchen and my husband was counting the eye cards for distribution, he suddenly called me in a very excited voice. I went over and saw that there was VibhutI (sacred ash) sprinkled on some of the cards. Among a pack of 1000 cards, Vibhuti had appeared on several of them! How did it happen? Only Grace could be the answer to that. Thank you Mohanji! A year ago I was out for dinner with my friends. After dinner I went with one of my friends to the car, when I realized that my phone was missing. We started to first search for it in my handbag, her handbag, then car, then back at the restaurant and streets all the way to the restaurant. We searched everything several times. We called other friends to check if anyone knew where it was, but there was no clue of the phone anywhere. After 30-40 minutes I gave up searching and accepted that my phone is gone for good. Then I saw a black cat approaching the car. She gazed at me and I intuitively knew it was not an ordinary cat, but someone materialized, who wants to help me. I looked at the cat and kindly asked her to bring me back my phone and then I left. I was driving and my friend was sitting next to me when she suddenly saw my phone on top of my handbag that she held in her lap. We were both shocked! How was it possible to appear like that, after searching so thoroughly?! Anyway, I was grateful and I mentally thanked the person who took a form of a cat to help me. In that time I did not know Mohanji. I heard His call this year and connected to Him. Recently my friend reminded me about the situation with the phone and I immediately realized it was Him who helped me. But, as I was doubting, I told Him that He looked nice as a cat. He knew right away what I was referring to, so he smiled and told me that He had to show me that He always took care of me and that He always gets His job done. 1) If you want to achieve liberation you have to surrender fully and allow the master the opportunity to cleanse obstacles that are preventing your liberation. In order for this to happen the main obstacle, which is the mind, has to be stilled. The more stillness of the mind that is cultivated the more surrendered you are becoming. This provides the right environment for the master to perform cleansing. 2) Remain in his energy field either by being in his close proximity or stay connected to his consciousness wherever you are. This can be done by japa, meditation etc. Distance does not dilute the actual effect. The master resides inside of your being, so there is in actuality no distance at all. In so doing you are allowing him to shine the light and in so doing dispel the darkness from your being. With every breathe chant the name of your master and in this way you will be attracting his grace towards you day and night 😊. Your life will also become infused with peace and happiness for no apparent reason. 3) Follow and practice his teachings with sincerity and discipline needs to be cultivated. Masters are always there to help any disciple who is sincerely seeking liberation. So become sincere and realise that the path to liberation is not a part time occupation but a full time 24/7 preoccupation. You have to in a way “convince the master of your sincerity” by practicing his teachings wholeheartedly and once this has happened, miracles and mind blowing experiences start happening. In November 2015 I took a flight to Toronto as my mother was severely ill and in the last few days of her life. It was one of the toughest journeys of my life. Rajesh(Vijay) & Hemant from the UK kindly informed Mohanji about my Mother’s situation. 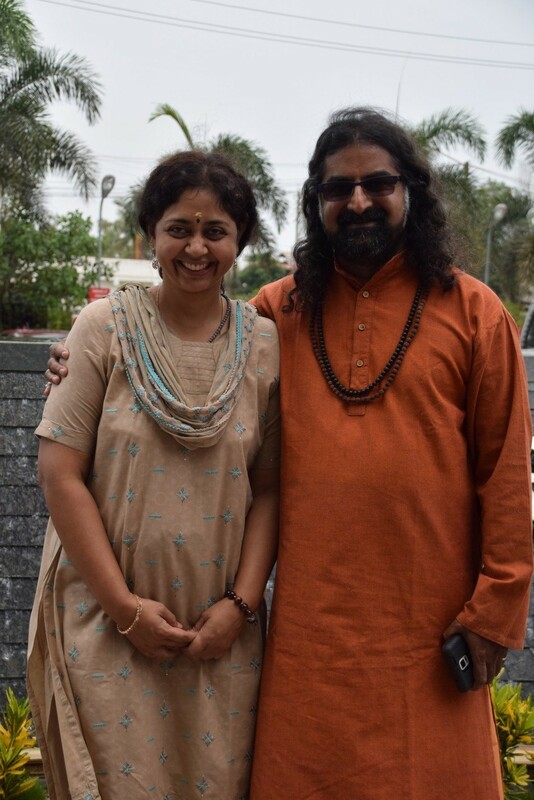 He responded saying “I am aware, please tell Skandha I am with her and taking care.” That message was very comforting for me to get this assurance from Guruji. A few days after my arrival Mum passed away peacefully with her children around her singing bhajans and chanting prayers. During this incredibly difficult period I had a few experiences which illustrated the grace and compassion of Mohanji. Prior to landing in Toronto I listened to the Shiva Kavach, which I have been religiously doing every morning since attending the retreat in the UK last July. Towards the end of the Shiva Kavach, I opened my eyes and looked through the window of the plane. To my amazement all I could see was Mohanji, and in the background the clouds! The image was the one in the latest eye card. When returning back to the UK three weeks later after taking care of my mum’s funeral & rituals and also seamlessly moving dad into a suitable nursing home, I again listened to the Shiva Kavach prior to landing in the UK. It was very gloomy and in fact there was a bit of wet snow when we touched down. Towards the end of the Shiva Kavach, there was suddenly a very bright light beaming straight into my eyes. I opened my eyes in shock to find that the sun had briefly come out. It was unbelievably bright. It lasted only a few minutes. At the end of the Shiva Kavach the sky turned very gloomy again. For me, this again illustrated the power of the Shiva Kavach and the blessings of the divine. One more incident I like to share. Mum had a full size laminated picture of Sathya Sai Baba which she treasured. I felt strongly that I should bring this over with me in memory of her. I called up the airline to see if I could bring the picture over. To my surprise the picture measured 62 inches in height and weighed 18 pounds. The airline told me the cut off height was 62 inches and weight 10 kg (22 pounds). To me that was a miracle! With the almighty’s grace the picture arrived home intact. My dearest friend Jay picked me up at the airport. Even though it was a very long drive, he made sure the picture arrived at our home safely by securing it carefully in his car. I can only say, those three weeks have been the toughest I have faced so far in my life and my salutations to Mohanji for being with me guiding, guarding and giving the strength throughout. I did feel his presence at every situation. My gratitude and pranams to Guruji. My trip to the Kumbh Mela in Nashik in 2015 is one I am eternally grateful for. We left for Nashik on September 12th and had a restful stay at Hotel Express Inn in Nashik. The next day September 13th , we were to take the holy dip in the Godavari as part of the Kumbh. I had read up the significance of the Kumbh Mela and felt blessed that we were going to participate in the sacred event in the presence and with the blessings of Mohanji, lovingly called ‘Father’ or ‘ Baba’. I must add that I had heard about unmanageable crowds and difficult conditions in such gatherings. But in the blessed presence of Mohanji, events aligned themselves smoothly! We parked our vehicles just half kilometer from the ghat, while we had initially been prepared to walk a few kilometers! We reached the ghat and found it empty, as if it was meant just for our group!! Mohanji gave us instructions on how to take the dip – we were to remember, thank and pray to/for our ancestors, our Kula Devathas, Ishta Devatas, our family members, near and dear ones, and others whom we have known and who have departed from this world and of course ourselves. Someone our family knew well for many years, who was a very blessed soul- reading horoscopes for over 60 years for free, had passed away just two days back. I took a dip while remembering him also. We had taken the dips during Brahma Muhurtha ie around 3.30 – 4 am, which is the best time for spiritual endeavors. I sought Mohanji’s blessings too after the bath and I could feel cleansed from within. I was steeped in amazement at how a group event could go about so smoothly. The second dip was on the 18th and it was even more wondrous! During this dip, one of the group members poured some of the Godavari water on Mohanji, saying Om Namah Shivaya and the entire group did the same. Mohanji also poured water (and his blessings) on all of us. Once we came out of the water, the smell of Udi/Vibhuti permeated the air and there was no doubt why!! Mohanji looked just like SaiBaba with a towel wrapped on his head and standing under an umbrella, held by a devotee (it was raining – the Gods were showering their blessings). Photos taken during the dip showed blue orbs (indicating divine presence) above Mohanji as he took dips in the river! Little wonder that we felt very complete and satisfied when we left! On the evening of the 13th, we had meditation and satsang at the hotel’s banquet room. It was the Power of Purity meditation and was followed by Shiva Kavach chanting. The entire atmosphere was charged with divine energy, because it was in the presence of Mohanji and I felt the essence of every word uttered during the meditation. Tears of gratitude and a feeling of deep peace and satisfaction enveloped me throughout and as I chanted the affirmations, I knew I let go of unnecessary emotions and negativity. I was left with a feeling of wanting to do good and realized what I had read earlier, about feeling complete and at peace when we are in gratitude. I am extremely thankful to Mohanji for it all. During the Satsang, Mohanji answered questions that came up and they seemed relevant to all present. One of them I think deserves special mention because it was from my 6 year old niece. It was, ‘Who made God?’ Of course, Mohanji gave a beautiful and simple explanation. Here is a short description of my recollection – God may be described as a brilliant light, the equivalent of innumerable suns, as a vast amount of energy, without a beginning or end, present everywhere and from whom everything we know originated. Another experience that I would like to share is from our visit to Bhagwan Nityananda’s Samadhi in Ganeshpuri. Mohanji did not accompany us, as he wanted to visit an old swami called Vasudevan Swamiji in Vajreshwari. This was my first visit to Kailash Bhavan and I had not even read about Bade Baba (as Bhagwan Nityananda is referred to). We washed our hands and feet at the hot springs pond and proceeded into the Bhavan. I sat down to meditate in a room and felt wonderful energy. After that I tried to peer through the glass enclosure of a room where Swami Nityananda used to sleep. I felt drawn to the door, as if I wanted to just go in and at the same time, the wonderful scent of Vibhuti was coming through the door! I enjoyed this experience for a while, and later learnt that the others in the group too felt the same draw of energy and the scent of Vibhuti through the door! The arthi that we attended next at Bade baba’s Samadhi was again very fulfilling. One can describe this state as one in which the mind does not do its chatter and we are engrossed in whatever we are doing, without any distraction – be it participating in the arthi or chanting some nama. Then we left for Vasudevan Swamiji’s house. Mohanji was there and he casually mentioned that he was there at Kailash Bhavan! (That explains the strong vibhuti scent!) I understood that he doesn’t need to travel just in this physical plane that we all see! Every stone in Vasudevan Swamiji’s house represented a God; Lakshmi, Kaliya Narthana Krishna, Shiva, Hanuman are a few I can recall from the long list mentioned by the Swami and these Gods I learn’t come and give darshan to Vasudevan Swamiji because of his bhakthi (pure love)! Mohanji explained that one can feel the energy of about 50 temples in just that one room! And I experienced it – when we sat down in the room and meditated for a few minutes, I could feel great peace, a quiet mind and desire to focus. Later we sought the blessings of Swamiji and left for Mumbai. During the car ride back, I felt grateful and blessed and as if to strengthen it, I smelt the divine scent of Vibhuti again! This time of course I knew it was because of Mohanji, because he was also in the car! All I can say is again, I felt blessed! As I wondered where I should begin saying the thank you(s), I realized it began at home! I am thankful that I was born into a family with strong faith in the Almighty and for my parents who nurtured and strengthened it. All of this has guided me to this path and I pray for unswerving, strong faith and purity and magnanimity of intent and action. Words cannot truly express the gratitude I feel towards Mohanji for his grace and kindness! I would also like to thank all the organizers, who have put in many weeks of hard work in order to organize this pilgrimage. All legs of the trip were handled with great care. A nice, informative write up about the significance of the Kumbh Mela and other places we were to visit along with a detailed itinerary, was a good idea. Travel arrangements, food and accommodation were great and the company of others in the group, who also wanted this wonderful spiritual experience with our Guru Mohanji, made this trip an unforgettable one.